← Cell Towers Placed Directly on School Grounds? Are You Serious? In a recent study published in the journal of Environmental Toxicology and Pharmacology , an investigation was performed to study the effects of exposing rats to radiofrequency (RF) radiation from Wi-Fi devices and to further study the possible protective role of administering an olive leaf extract to reduce the damage in liver and kidney cells of the exposed rats. According to the article, there has been “considerable interest in finding natural antioxidants from plant materials in order to repair several diseases caused by endogenous or environmental factors such as artificial EMF.” It was further stated that olive leaf extracts have been shown to have “anti-oxidative” properties. As a part of the study, rats were exposed to RF radiation from Wi-Fi devices broadcasting with a signal at 2.45 GHz. Rats were exposed for only one (1) hour per day for a total of 21 consecutive days. This type of exposure was referred to as “sub-chronic.” Control rats were tested under the same conditions but there were no RF emissions from the Wi-Fi devices. The results summarized above appear quite stunning, and the implications are clear; RF radiation induces adverse biological effects upon cell structures and the functioning of those cells. Use of antioxidant agents, in this case olive leaf extracts, may be able to provide a protective role against damage caused by RF radiation exposure. The exposition to the radio frequencies (2.45 GHz) induced metabolic disorders. The exposition to the radio frequencies (2.45 GHz) induced a diabetic-like status. The exposition to the radio frequencies (2.45 GHz) induced oxidative stress. Olive leaves extract prevented against metabolic alterations. Olive leaves extract enhanced antioxidant responses. “Effects of Olive Leave Extract on Metabolic Disorders and Oxidative Stress Induced by 2.45GHz WIFI Signals,” by Salah, et. al., Environmental Toxicology and Pharmacology, Volume 36, Issue 3, November 2013, pages 826–834. One additional piece of technical information about the study results is that although the published paper listed the “exposure system” as described below, it did not provide specific information on measured exposure levels, for example, in microwatts per m2. 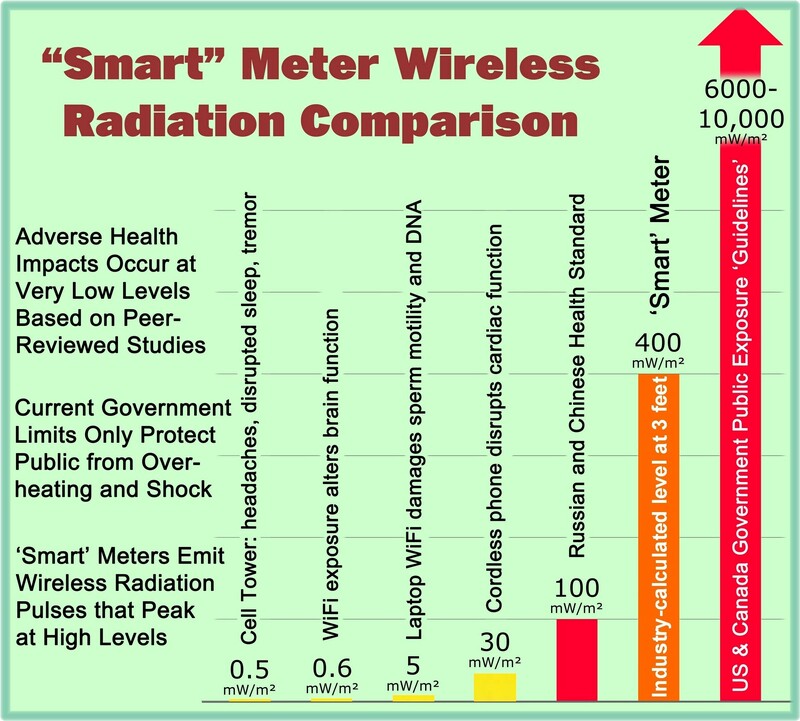 This entry was posted in Smart Grid, Smart Meters, and RF Emissions and tagged Health Effects, RF Emissions, Wi-Fi. Bookmark the permalink.